While there wasn't the amount of free gaming crap that you can find at, say, E3 or TGS, there was still plenty of stuff to fill your bag. 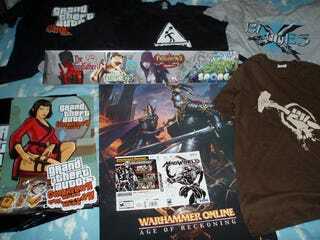 Rockstar Games had the most, with stickers, flyers, and t-shirts for Chinatown Wars. Sega had shirts for The Conduit, Mad World, and House of the Dead: Overkill. EA even put up the cash and gave everyone a cardboard poster carrier with a strap! But my favorite piece of swag has to be the autographed Mad World game cover by Shigenori Nishikawa and Atsushi Inaba from Platinum Games. Closeup after the jump!